This reference design shows how a “CEA 2045 module adaptor box system” can be built using off-the-shelf parts. Systems built from this design system are installed with solar inverters in order to attach CEA-2045 form factor communication gateway modules to the inverter. To access the internal design and communication interface specification of the CEA 2045 module adaptor box system, click here to download the file. Two features of this design are that it is offered royalty free to SunSpec Members and that multiple, interchangeable sources are available for each component. No treatment is given to the design or selection of the system enclosure. It is assumed that product manufacturers will select appropriate materials/components for this purpose. This design was created in support of the CSI4 project funded by the California Energy Commission and managed by EPRI. 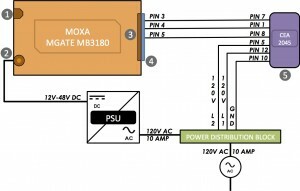 The Modbus gateway described can be acquired from Moxa (www.moxa.com) and the female CEA 2045 connector can be acquired from TE Connectivity (www.te.com).